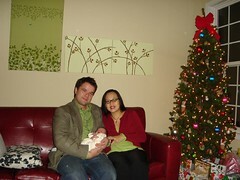 It was three weeks ago today that Monkey and I welcomed our sweet little girl, Quynh, into our family. 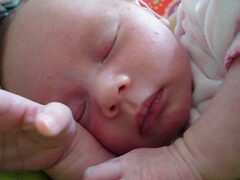 I shall fill in birth story details later, but for now, I thought I’d peep and tell you about the absolute love of our lives (we are so smitten in love with this sweet little being). We are so glad to be sharing this Christmas with the newest member of our family (and we were so lucky to celebrate early Christmas with doting (and extremely, wonderfully helpful) aunties and grandparents!!) and send happy holiday wishes to you all (friends, apologies in advance; we didn’t get around to sending out Christmas cards this year!). Merry Christmas from our little family to yours!